Two out of three companies in Malaysia and Singapore are not transparent about their palm oil use, the World Wildlife Fund contends. Most of these companies do not source palm oil that has been certified by the Roundtable on Sustainable Palm Oil. Malaysia and Singapore’s brands have lower sustainability grades compared to global brands. The majority of Malaysia and Singapore’s most popular brands have failed to push for the use of sustainable palm oil in their products, with some refusing to disclose who they buy from, according to a new survey by the World Wildlife Fund (WWF). Earlier this year, the international NGO surveyed 47 locally based food and restaurant-chains, with 27 from Singapore and the rest from Malaysia. The survey is called the Palm Oil Buyers’ Scorecard (pdf). Of the 47 companies that were contacted, only 16 disclosed information on their palm oil usage. And half of those had taken no action to support the use of sustainable palm oil. “Even though 100% certified palm oil is available today, most businesses in Malaysia and Singapore are still not sourcing it,” the report of the survey read. 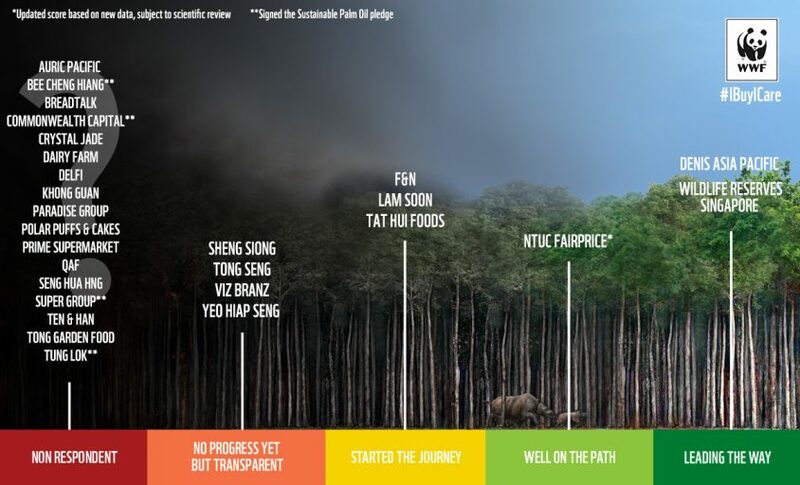 A snapshot of Singapore’s brands surveyed by the WWF in its Palm Oil Buyers’ Scorecard. Image courtesy of the WWF. Palm oil is one of Southeast Asia’s biggest industries, with Malaysia and Indonesia responsible for most of the world’s production. These countries are also home to many manufacturers that use palm oil. For its part, Singapore serves as a base for the regional operations of major growers and refiners in the industry, as well as a financial hub by supplying loans and investments to these companies. As the industry expands across the world, calls for more sustainable practices have intensified as well on the back of environmental concerns. Many oil palm companies take community lands without their consent, backed by government officials in some of the most corrupt nations on earth. The industry’s expansion has also driven the destruction of forests and biodiversity, especially in Indonesia, a leading greenhouse gas emitter because of the clearance of its forests and peatlands for agriculture. “Unsustainable practices in the palm oil industry are at the root of the transboundary haze and deforestation,” Elaine Tan, CEO of WWF-Singapore, said in a statement. She was referring to the annual fires that burn on Indonesia’s desiccated peatlands, which have been widely drained and dried by oil palm and pulpwood planters, rendering the soil highly flammable. Since 2009, the WWF has published the annual scorecard, tracking the sustainability commitments of Malaysian and Singaporean brands. The WWF defines “sustainable” palm oil as that which is certified by the Roundtable on Sustainable Palm Oil, the world’s largest association for ethical production of the commodity. Companies that join the RSPO are forbidden from using palm oil linked to the destruction of virgin forests and peatlands, which is not necessarily illegal in Indonesia and Malaysia. At the same time, some companies have gone further than the RSPO, pledging to eliminate the destruction of any kind of forest from their supply chains. This year’s scorecard found that non-disclosure and lack of action was higher among brands in Singapore and Malaysia than in other countries. Global brands had an 80 percent response rate, and over 60 percent have sustainable sourcing commitments for palm oil. In comparison, 30 percent of regional brands responded to the WWF and only three have public commitments on palm oil use, despite Southeast Asia’s position as the world’s leading palm oil producer. “Singapore is at the heart of a region that supplies 85% of the world’s palm oil. Our local brands need to show leadership by being accountable for their palm oil use and take real action to source sustainably,” Tan said. The report identified a lack of internal capacity among companies as a key obstacle in adopting sustainability commitments. “One of the things we realized is that most don’t have a sustainability person, let alone a team,” Denise Westerhout from WWF-Malaysia told Al Jazeera. Meanwhile, companies cited the cost of sourcing sustainable palm oil and a lack of consumer awareness and demand for certified sustainable products among the reasons for not buying certified sustainable palm oil.